Suitable for most turbo cars with an Air Flow Meter. Made from billet aluminium, this atmospheric diverter valve dumps the charge-air to atmosphere creating the "Whoosh" sound when the throttle is lifted. This increases both quicker throttle response and higher clamping load to maintain boost pressure more reliably. Unlike single piston or diaphragm diverter valves, this uses counter balanced springs and dual pistons to prevent the valve from leaking air into the intake system at idle. This prevents our diverter valves suffering any of the failures associated with single piston and diaphragm type diverter valves. All Forge Motorsport Dual-Piston Atmospheric Valves have been designed and built with the intent of venting 100% of the residual charge air remaining in your forced induction system to the atmosphere at throttle lift. While we have incorporated many elements into the design of the Dual-Piston valves to aid in their compatibility with mass air-flow sensor equipped vehicles, we cannot always guarantee that each individuals application will be compatible with a valve that vents the charge air into the atmosphere. Forge Motorsport nor any of its Authorised Distributors can assume any responsibility for any adverse effects resulting from the installation of this valve onto a vehicle whose engine-management-system, whether factory or aftermarket, is not capable of compensating for the loss of metered air through a vent-to-atmosphere valve such as this. In The Box: 1 x FMDV004 Valve. We use DPD 24hr service. Despatch times can vary, depending on what you have ordered. But if the item is going to be delayed longer than 24 hours we will contact you. The item "Forge Motorsport Universal 25mm Blow Off BOV Dump Valve FMDV004 BLACK" is in sale since Thursday, November 8, 2018. 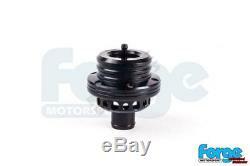 This item is in the category "Vehicle Parts & Accessories\Car Tuning & Styling\Other Car Tuning & Styling". The seller is "darkside-dynamics" and is located in Gloucester. This item can be shipped worldwide.